Use the silicone on the rubber too. Why are verts so pimp? Because some things are just meant to be. you guys know if this will fit the vert? GJGM is this the one you have? Yep. There is no difference between a coupe and vert front bumper. Yes, just be careful with the quailty. Before buying Vorsteiner I purchased one from Eurospec and I was not happy with the quality to the extent that I returned it. $500 is real cheap - I'm suspect, but you never know. 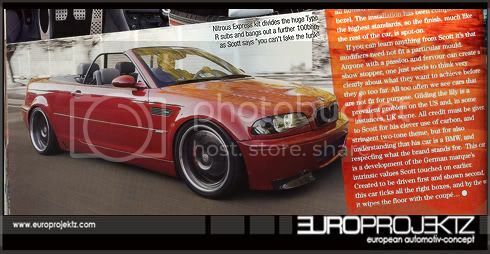 For those considering a CSL style bumper make note that you will need parts for a 2001 M3 - front aluminum carrier versus the kevlar used on 2002+ models, plus reservoir, and numerous other items. Additional cost $300-$400 I found out the hard way. I've got all my other stuff ordered to ensure a proper fit. I love my Vorsteiner stuff though - absolultey excellent. You'll have to get this stuff from BMW. List is available for those who need it. All times are GMT. The time now is 08:24:09 AM.